Many people turn to the internet for information. They want to know something, so they turn on the computer and do a search on the subject. They scroll through the search results, looking for websites that can give them the information they need. By creating information products to sell on your website, you can create a very nice income from home. An information product can be anything from an e-book to a special report, or even an mp3 recording or video. If you already have a website and have done your keyword research, you are one step ahead of the game. If not, your first step is to determine what market you would like to target. The options are limitless. For example, let’s pretend you are interested in targeting dog owners who would like healthy food options for their pets. By using a keyword tool you can determine what words and phrases people use when they search for healthy dog food. Are people searching for homemade dog food, vegetarian dog food or healthy vegetarian dog food? Your best scenario will be to find a keyword or phrase that a lot of people are searching for that is also not used by many other competing websites. Once you have done your keyword research and know what your target market is looking for, it is time to build your website. You can outsource this and hire a professional web designer. However, if you plan on making lots of changes to your site, you might want to invest in software such as Microsoft FrontPage or Xsite Pro. These programs allow you to quickly and easily design websites without knowing HTML code. The next step is to create your information product. When you are ready to set your price, take a look around the internet and see what the going rate is for your type of product. You will want to set up a shopping cart and information delivery system on your website. There are many to choose from, so do your research and find what will best fit your needs at a price you can afford. When it comes to creating information products, you can also team up with another website owner and create the product together. This is called a joint venture. You will split the work and you can both sell the product on your websites. To increase your sales and profits, you might want to open your product up to affiliates. An affiliate will advertise your product, and when they get a sale for you, you will pay them a portion of that sale. 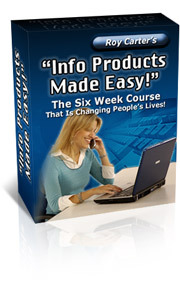 There are many benefits to earning an income with information products. People are always going to want to learn things, and there will always be a market for information products! This is a wonderful way to make a passive income from home. Plus, you can create a product today, and still be earning profits from it five years down the road!